Our cozy Ponderosa Cabin in the woods awaits you, come and relax in our spacious home fully stocked for your enjoyment. This vacation cabin in Truckee has a nice flow and open concept, just off of the living room you'll find a big deck for those hot summer nights. You'll enjoy spending time in our living room watching the TV or playing a game by the fireplace, our big dining table will sit everyone, have a quick breakfast or an elaborate dinner, our kitchen is fully equipped for either. The big master suite is on the same floor as the living room, on the floor below you'll find the other 3 bedrooms and a shared bathroom. With plenty of space for everyone including your 4 legged family members, this cabin in the woods is sure to be a great spot to get away from your busy lives and lose yourself in the peaceful and refreshing mountain atmosphere. 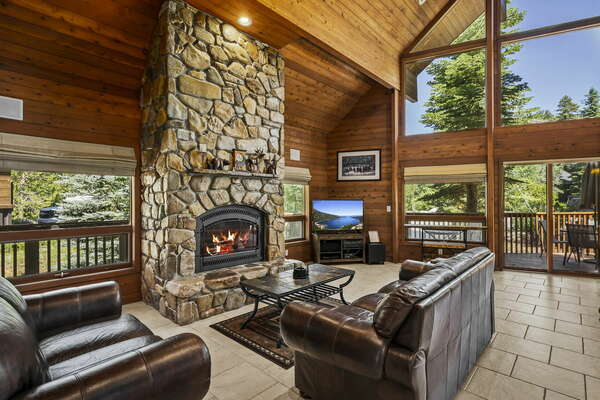 This beautiful Ponderosa vacation home is conveniently located within a few minutes' drive to downtown Truckee, restaurants, shops, the Regional Park and the Truckee River, not to mention that Northstar is less than 15 minutes away.